Cody Cepeda does not celebrate as he embarrasses professional skateboarders. At Battle At The Berrics VII, the skateboarding adaptation of basketball's HORSE, just the briefest of emotion flickers across his face—a faint grimace or smile—when he misses a trick or beats the hell out of some unsuspecting pro. But then it's back: a look as bland as a raw potato. The first to fall was Trent McClung. McClung has been a professional skater for Element since 2012. 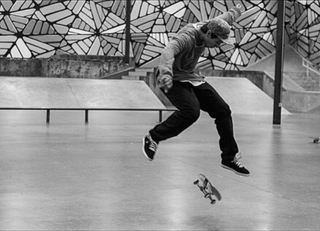 Skateboarding is all he does, and he does it all over the world. Cepeda is 23-year-old community college dropout and failed business owner who splits time between friends' couches in Port Huron, Michigan. "All my friends say the same thing about it, that I'm a zombie in my interviews. Stone-cold," Cepeda says. "I'm just confident, and I look at the pros as though they're my peers. I don't look at them as if they're any better than me, because a lot of these guys have been skating the same amount of time as me." In the first round of BATB VII, McClung won the rock-paper-scissors for the first turn and proceeded to land 32 tricks in a row. He was in complete control, and Cepeda was up to S-K-A-T and down to his last letter. Then McClung missed a switch varial heelflip. The smack of his board on the concrete echoed in the warehouse. He looked over at the camera and said, "Game over." Cepeda beat him senseless with a barrage of double flip variants. There was no second chance for McClung, after which he said,"That was game right there." Thirty-two skaters from all over the world are competing in BATB VII. Half are pros, like McClung, and half are guys like Cepeda: average Joes. It's an intriguing concept, similar to NBA stars challenging fans to a free throw competition. Sure, LeBron is the complete package. But is he the best on the line? And what does it mean if a truck driver from Sheboygan is better? "Basically I just got good at flatground skating because of lack of spots," Cepeda says. "I'd get out of school and just throw my headphones on and skate, just practicing every day for years." He'd roll and back and forth over the bridge next to his house in Croswell, Mich., a one-traffic-light farming community, because it was the biggest stretch of smooth concrete around. There are plenty of skaters that are flashier than Cepeda. They roll faster and they pop higher. But Cepeda has one direction in BATB, and that is over, with the same plodding inevitability of a steamroller. On Sunday, The Berrics released his round two matchup against Shane O'Neill, the runner-up in last year's competition. Cepeda won again, moving on to the Elite Eight. His thorough trouncing of the world's best pros has brought the sponsors swooping in. He won't be going back to Michigan any time soon. "This contest has by far been the most beneficial thing to my career thus far," Cepeda says. But he doesn't sound that excited. He doesn't sound disappointed or angry or sad. Through the phone, you can almost see his blank fish eyes slowly blink, waiting, watching for what's next.